Sales Of Existing Homes Hit Three-Year High : The Two-Way The housing sector continues to recover. Sales rose 5.9 percent last month. It's the second new piece of positive news about the economy. Earlier, gross domestic product growth for the third quarter was revised upward. 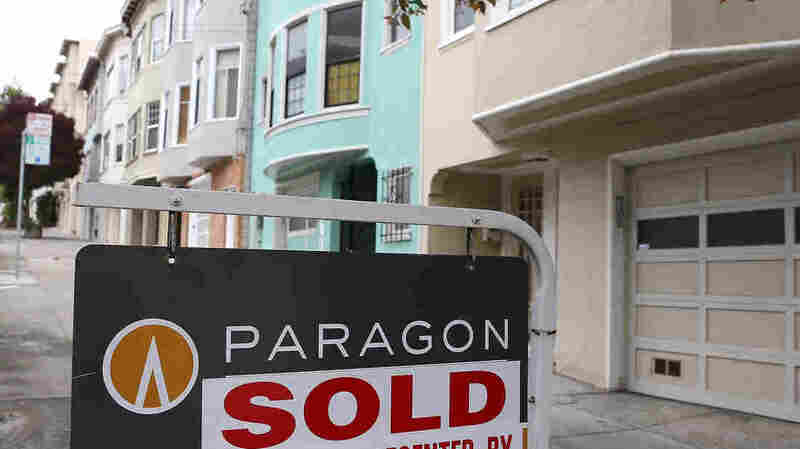 San Francisco: A "sold" sign in front of a home earlier this year. There was a 5.9 percent rise in sales of previously owned homes in November from October, the National Association of Realtors says. At their 5.04 million annual rate, sales were the highest since November 2009. "Momentum continues to build," NAR chief economist Lawrence Yun says in the organization's report. As Reuters notes, "the U.S. housing market tanked on the eve of the 2007-09 recession and has yet to fully recover, but steady job creation has helped the housing sector this year, when it is expected to add to economic growth for the first time since 2005." Earlier today, there was word that third-quarter economic growth has been revised upward again.